As a website owner, Google Ranking is probably the most frustrating part of owning a business. After all, you have paid all this good money for a new website, you expect people to be able to find it easily when you Google it. Unfortunately, it isn’t that simple! Welcome to the complicated world of SEO (Search Engine Optimisation). You have heard about it, and probably received a thousand unsolicited emails to your business offering amazing results by paying someone to do your SEO. So today let’s find out the reasons websites don’t always rank well, about basic SEO and how you can get as high as possible on Google. Are you ready??? Buckle up! New websites take (on average) four to six months of consistent work to rank well on Google. Google is a fickle beast that has a set of rules for how websites will be listed in a Google Search. The thing is, even if we had a copy of these rules, it would only work temporarily. 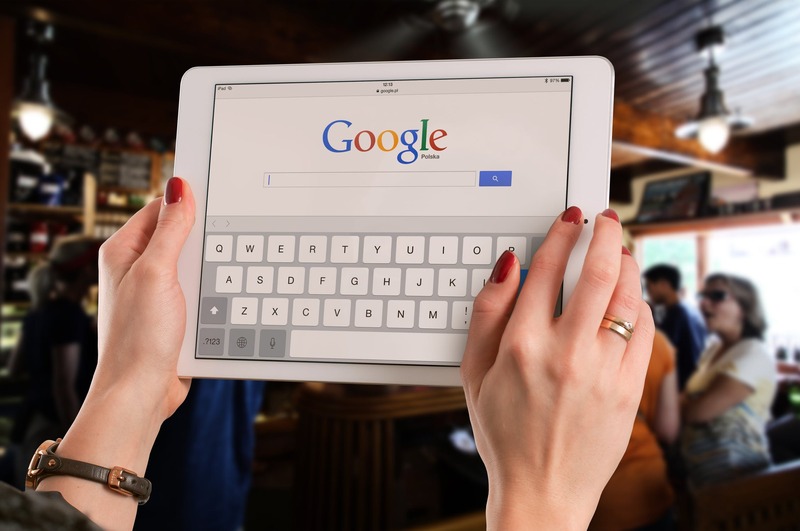 Google is constantly changing these rules to penalise businesses that are using Dodgy SEO practices and reward businesses that are offering great content and consistent updates. Which makes sense really because the better the content is on your website, the more people want to read your website, the more customers you have, and the higher your website will rank on Google. Google’s algorithms crawl through all the websites in the world to find out what your website is about by analysing keywords. It is your job as a website owner to ‘Fully Optimise’ your website to ensure that Google knows exactly what your website is about and where it should be in the ranks. 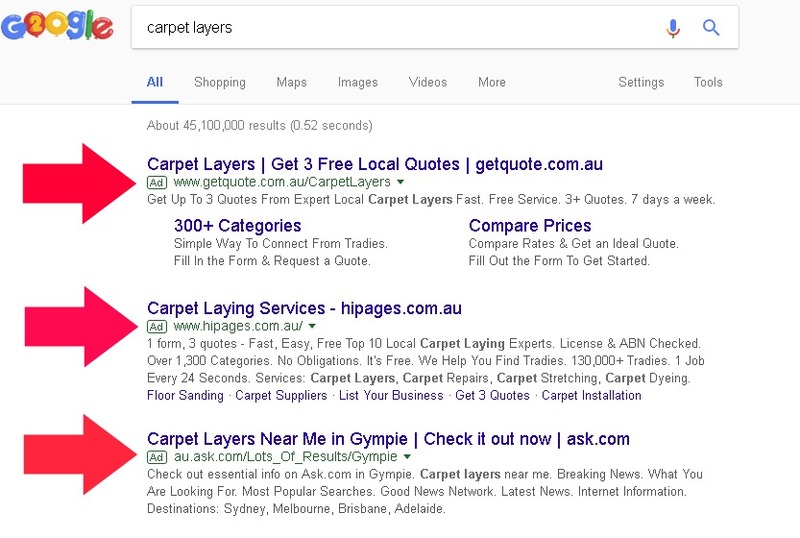 When you Google any phrase, you will see that there are always paid advertisements at the top of the Google search. These are paid advertisements. You can always tell because there is a tiny box on the left-hand side that says ‘Ad’. We have pointed it out below. All the other websites that are listed underneath those advertisements are ones that are unpaid – they have gotten there through SEO. You might notice that when you Google a business or service, the larger businesses or corporations are always up the top. These businesses are spending big dollars on keywords or phrases that will ensure that you see them first. There are a few really easy ways you can do optimisations for SEO yourself. This is free and super easy – here is the LINK, just fill out all the fields – you will be asked your business name, address and ‘unique description of your business’. You can even get a Google Map that will help your customers find your location. Have a long and unique description of your business. You want a really detailed description of your business. For example, for Tenacious Digital I don’t want to put ‘Website Creator’ – because there is a bisquillion others out there, you want to be niche, direct. So I would make the description something like ‘Gympie Small Business Website Creation’. Google always loves people to talk about Google. 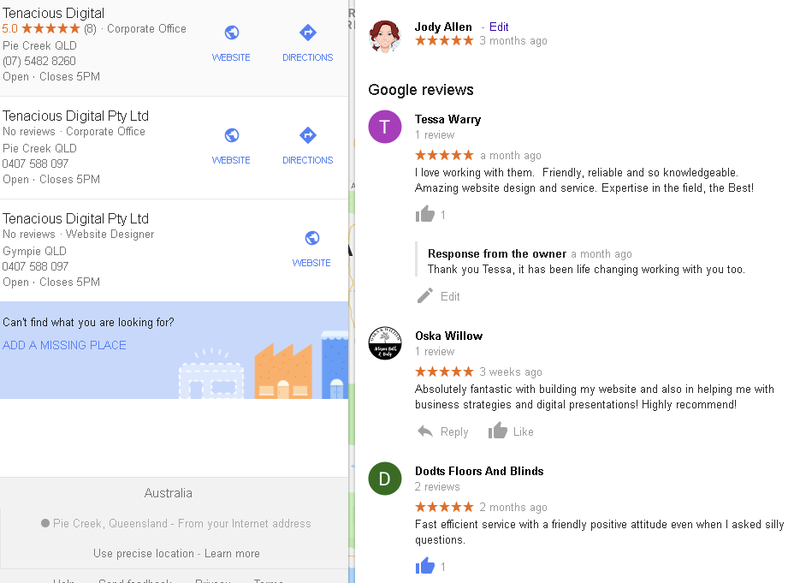 So it goes without saying that if your customers are leaving Google reviews about your website, your website will rank higher. The problem with Google reviews is that you need to be logged into Google to leave a review – and not everyone is. But if you mention it to your customers and ask them nicely, hopefully, those with a Google account will leave a great review to help you along! Here is what comes up when I Google Tenacious Digital. To do this – grab a sheet of paper and write down every single question you are asked by customers in a day/week. These are the exact keywords you should be using on your website – and this is what you should be creating content about. For example. If I Googled ‘How to Grow Roses in Gympie?’, and if there is an article titled ‘How to Grow Roses in Gympie’ – there is a good chance that the article will rank well as it is using the keywords and is straight to the point. Plus it helps that Gympie is a pretty small town so there isn’t literally thousands of people writing articles on how to grow roses there. Another example on a larger scale, if I Google ‘Gyms in Brisbane’ – than because there are so many gyms in Brisbane, and they are all competing for those keywords, it will be harder to get to the top – or even in the first five pages or so. Making your keywords a bit longer and more specific, you are more likely to rank. If you had an article on ‘The Best Women’s Gym in Aspley’ – than because the keywords are a lot more specific, there is a better chance of being found on the first page. So think about your business and how ‘specific’ you can be to your community. Of course, not everyone can write content – if you need some – give us a ring at Tenacious Digital! These plugins are terrific because they walk you through step by step to make every item on your website optimal. However like all plugins, they can be glitchy at times, so when in doubt, have your web developer install them for you! How Tenacious Digital Can Help! The SEO (search engine optimization) service we provide with your new website is rudimentary, in order to make the initial build more affordable. More sophisticated, professional services are available and are more expensive, so the answer to your question is very complex. We can combine caring for you website with SEO. “SEO is an advertising campaign”. The more you invest the better your results. What is your budget for getting to number 1? Do you know what keywords your customers use when searching for your kind of business? Do you want to be number 1 in your local area, regionally, or nationally? Or number 1 for your industry or for certain targeted demographics? Do you want number 1 status for a single keyword, or do you need multiple keywords? Can you afford professional SEO, or do you want to stick with basic SEO? Being number 1 on Google is not automatic. It needs to be worked. Keyword research needs to be managed and adjusted on a monthly basis. You can get to number 1 for a single keyword, and not even appear on page 1 for any other keywords. Placement takes management, and each keyword has a cost to move you up the ladder. It must be worked, or you will move down to those sites who are managing their placement move up. Top keyword placement is bought from Google. You bid against others in your industry and the highest bidder gets the highest placement. You bid by the keyword. Effective SEO is not “if you build it they will come.” It takes time and work to get you where you want to be. SEO is a speciality, and we have resources we can bring in to help. You will get what you pay for. 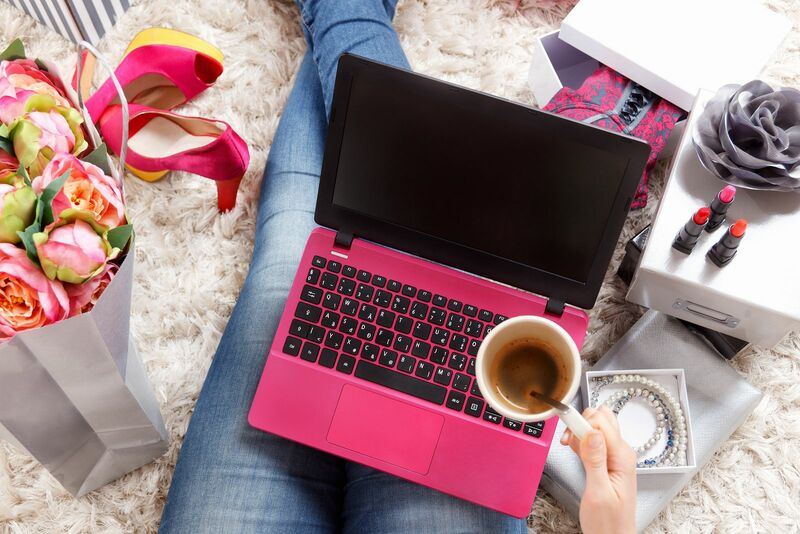 Keep in mind that there are other ways to attract business to your site including email marketing, social media marketing, and traditional advertising and marketing. Remember. Websites are not a ‘Set and Forget’ solution for your business. They take work, they need love. If you put in the time, Google will reward you!